Uncle Bill: When you get back, write a report which is detailed and simple, starting from the beginning. Q: Who did their own dubbing? Q: What are the differences between the International Version and the Hongkong Theatrical Version? Jackie Chan is licensed to thrill. Part 4 of the Police Story series sees Jackie Chan's agile Hong Kong police inspector Chan Ka Kui become embroiled in James Bond-style international espionage after he is given the seemingly simple task of following beautiful suspect Natasha to Ukraine. When Natasha is abducted at the airport, Chan sets off in hot pursuit only to discover that she is involved with international arms dealers and the sale of a nuclear warhead. 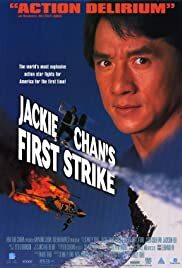 First Strike was made in the mid 90s, a transitional period for Jackie Chan, who was priming himself for his big move to the US. In order to broaden the star's appeal with the Western market, this one has a much more international flavour than many of his earlier films, with the action skipping round the globe, from Hong Kong to Ukraine to Russia and, finally, to Australia. The film is also less focused on pure martial arts mayhem, with more in the way of straight forward Hollywood style stunt-filled action, but when the kung fu does happen it is extremely well handled, with Jackie displaying his usual athleticism, impeccable timing, and flair for physical comedy. The rather messy plot and occasionally slow pacing prevents First Strike from being a bona fide Chan classic, but there is still plenty of inventive stuff to make this one a whole lot of fun, best bits being a wonderful fight scene in which Chan uses a stepladder as a weapon, an exhilarating ski chase down a mountain, some underwater shenanigans with sharks, and a scrap with two Russian man-mountains that involves Chan making a vertiginous leap onto a narrow ledge of a high-rise building.